Black Ice Software - Print2Email version 9.34 is released! 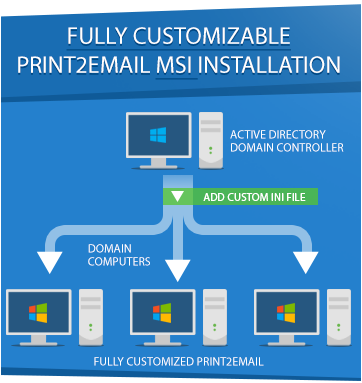 Fully Customizable Print2Email MSI Installation for large scale deployments! Black Ice Software has released Print2Email version 9.34, which includes improved MSI Installations designed to greatly simplify large scale deployment. The new Print2Email MSI Installations are now fully customizable through a custom INI file to allow Administrators to preconfigure MAPI, SMTP, Gmail, Yahoo, Hotmail, iCloud, Exchange and Silent email sending. System Administrator can create a customized DEFSET INI file for the Print2Email MSI installation for large scale deployment resulting in fully preconfigured Print2Email on every system! Besides the new fully customizable MSI Installation, Print2Email also includes improved documentation to let users take advantage of the new features! For Print2Email MSI Installer availability, please contact sales@blackice.com. Download the Latest Impact Print2Email!